Mediterranean dolma was always on the list of foods special to me, there is something fascinating in the taste and the appearance of the grape leaves. When I tried this raw, rice-less version for the first time, it struck me as possibly the tastiest raw dish I’ve had so far. The combination of flavours and textures is flawless. And the sauce – cilantro, lemon, tahini – it’s hard not to lick the plate. The original version of this dolma calls for Jerusalem artichoke, or sunchoke, which is an amazingly versatile root vegetable. I’ve been using Jerusalem artichoke syrup as an alternative sweetener for a while now, and would definitely recommend it. The actual root is not as easy to find (at least here in Florida) and the season is long gone. But after once tasting this dolma with sunchoke, I couldn’t wait for its new season to come, and decided to substitute it with jicama. I made some minor adjustments to the recipe and was very happy when it turned out well. I always get excited when I find successful raw recipes that are also simple and don’t call for the opening of young coconuts, dehydration, nuts, or long hours of waiting. This dish is just that – easy, fresh, and fragrant. P.S. We are so happy to finally have a blog banner. It’s by the talented Coco of Lark Creatif and Roost. In a food processor, pulse the sunchokes or jicama to achieve the texture of large rice grains. If using jicama, transfer it onto several layers of paper towels and pat to remove as much excess liquid as you can. You might need to do this several times. There’s no need to pat dry if you are using sunchokes. Transfer the jicama/sunchoke to a bowl and pour the lemon juice over, mixing with a wooden spoon to preserve the color. Then mix in 2 tablespoons of olive oil and gently stir in the rest of the ingredients. Season with salt and pepper. Place the filling into a fine strainer and let drain for around 15 minutes. Rinse the grape leaves and pat dry. Put around 1 1/2 tablespoons of the filling into the center of each leaf and fold. The stem end gets folded up first, followed by the sides, after which you are ready to roll tightly. 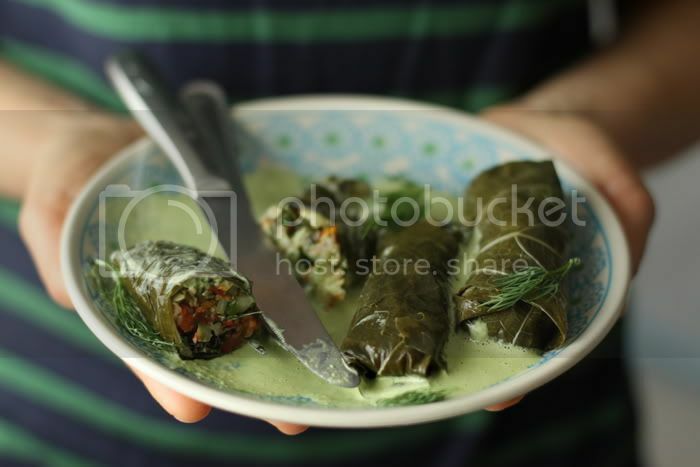 Coat the rolled dolmas with some olive oil and enjoy with green tahini sauce. In a high-speed blender, combine all the ingredients until smooth. This sounds superbly delicious. Looking forward to trying this! Those do look easy! Where do you get the grape leaves? I really want to make your sauce!! I love that these are simple to make but look like they took a long time. And all the flavors sound wonderful together too! Thanks for the great recipe idea. Where did you find your grape leaves? Things are lookin’ great :) and what a beautiful recipe! Thanks so much for your comments, everyone! Have a nice weekend. Hannah and Jamie, I got mine at a local health food store, they are without preservatives. You might also be able to find them in regular supermarkets, Greek markets, or delis that sell grape leaf dishes. The blog banner is beautiful. I love it. This is a dish I’ve skipped past so many times in Living Raw Foods. With your hearty endorsement I’m ready to give it a try. Jicama is much easier to find in my area. So your version may find its way to a dinner party very soon. Great new twist on an old favorite, very appetizing looking and sounding dish. Love the new banner! How does Paloma like the grape leaves? These look delicious. I’ve had them before in Greek restaurants and have liked them. I also enjoyed your Paris post! What a wonderful trip! We were there last year and introduced the city to our children. love sunchokes! we grow them at the farm where i work. harvesting them is too fun, digging around in the dirt. i could do it for hours. This looks so so so delicious. Your photos are gorgeous .. really :) So glad to find your blog! this looks great, i’ve never come across a recipe for dolma, now it’s definitely something i want to try! i think it would be a great idea for picnic food! 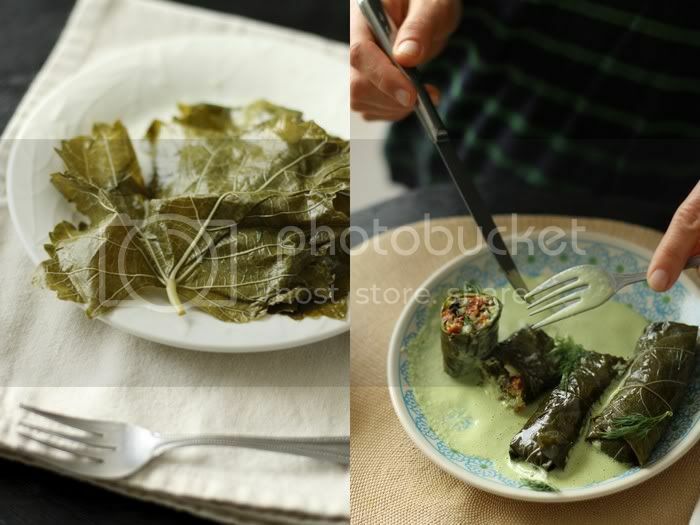 Dolmades are one of my favourite things to eat. I love the idea of a raw one, although the preserved vine leaves would be blanched right? I like to use fresh vine leaves from our grape vine and simply blanch them in boiling water for 30 seconds before refreshing in cold water. Not raw. But ultra yum! I’m really digging fresh mediterranean food right now, especially after my trip to Greece. What a wonderful raw version! These look so good – I don’t care for the standard meat & rice dolmas, but these look like a whole new world. Loving this! Last night I had the most ridiculous craving for dolmas, but given that I don’t eat rice, I passed. However, I’ll have to get out this book and make these!! Sean, Paloma doesn’t eat these much, but likes to lick the sauce. Sarah, thank you! You are heroic for taking your kids with you to Paris. I was so tired and overwhelmed, and I was only there with a couple of friends! What an amazing city. hearthstrung, how wonderful that you have access to the freshest sunchokes. Jessica, I took a peek at some of your photos from Greece. How beautiful, makes me want to go back! Sarah, thank you. Coco is so talented. Callie, hope you like them. I can’t believe it! 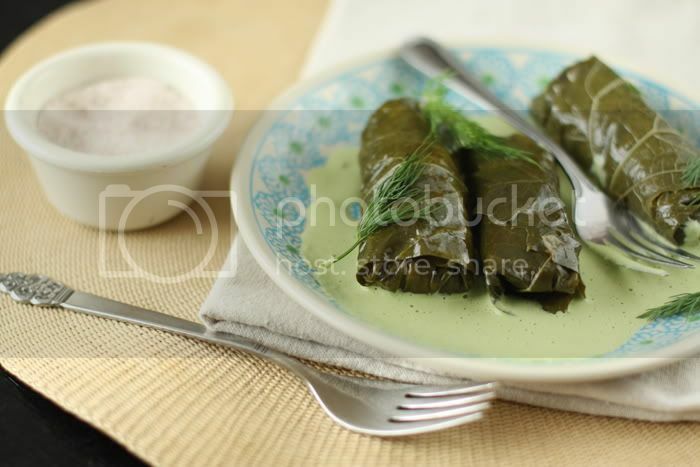 We were just planning to make some raw dolmas in the future:)) except we will marinate th vine leaves ourselves. We have planty of jerusalem artichoke in the garden, but it’s not is season yet. But don’t they turn dark in this recipe? Do you think it would work with cauliflower as well? We don’t have jicama. Norka, that’s great! If you pour lemon juice over the sunchoke/jicama as is done in the recipe, they won’t turn dark. I think cauliflower could work, I’d give it a shot. wow..these look ABSOLUTELY delicious. i need to make these..like yesterday. i adore dolmas but i’ve never had them with a sauce. your sauce sounds SO good! i’ve got to try it. Yum! These look really nice. I might try them with nuts or kohlrabi instead of the jicama. Thanks again for the thoughtful comments, friends. Sunny London, I see! Thanks so much for the link. hi, I love sunchokes too! when I can find them I buy a few extra and throw them in the garden and they multiply like rabbits!!! and they also have lovely sunflower like flowers : ) pure joy!!! These look great! i was wondering if the leaves you started off with to make these grape leaves were raw from the start? or do you let them marinate in the olive oil. i think i didn’t understand the first part of the recipe because the leaves looks so incredibly tender. Hi Celia, thanks for your comment. This recipe is for a 1 quart jar of marinated grape leaves that you can buy in a store. 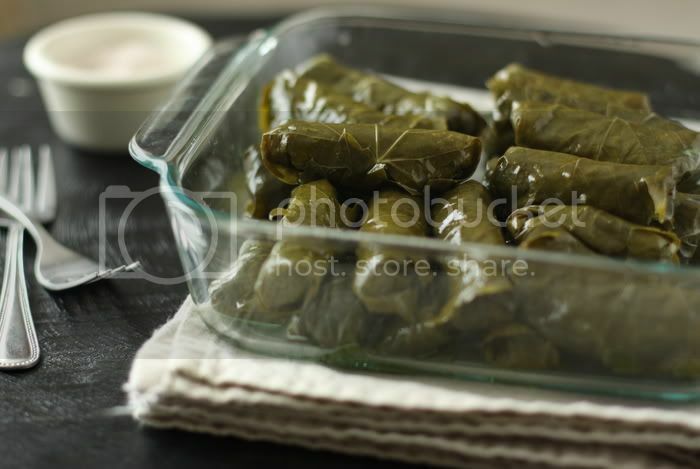 At the end, once the dolmas were rolled, we coated them with olive oil. Hope that makes sense. Love your blog! Jurselaum artichoke is a sunchoke, grows in California. It’s native to here. It grows very tall sunflower like plants. I’ll harvest the root this fall but could start now if I wanted. It’s so prolific it’s nearly invasive. By the way, the grape leaves can be fermented, they dont have to be blanched. I use kefir grains to ferment the leaves from my vine, with salt and garlic in water. They last a long time in the fridge that way. This is so amazing! I made this yesterday to celebrate fourth of July with my parents and they were so amazed it was all raw (I even used raw grape leaves straight from my grandma’s grape vine!!!!) We all fell in love with that tahini sauce and also enjoyed dipping some flax corn tortilla chips in it.